July 31st, 2016 m arked the 3 year anniversary of Jermaine McBean’s death. Jermaine McBean was a 33 year old African American computer engineer with no criminal history that was shot and killed in right here in Broward County by Broward Sheriff’s Deputy Peter Peraza. McBean was walking home on Dixie Highway in Oakland Park from a local pawn shop with unloaded air rifle that he purchased. He had the air rifle balanced on his shoulders behind his neck with a hand over each end according to accounts of eyewitnesses. Peraza, accompanied by BSO Sergeant Richard LaCerra and Lieutenant Brad Ostroff as he tailed McBean on foot into the Green Tree Apartments, ultimately fired the fatal shots when McBean, unaware that he was being followed as we now know, began to turn around to face the officers. Peraza and LaCerra both have been exposed as having lied to investigators on the question of whether McBean was wearing the headphones, or ear buds, which obscured his hearing as the officers were commanding him to heed their orders. While both insisted multiple times to BSO’s own investigator that McBean wore no headphones, a photo which surfaced last year that was taken by a nurse in the complex immediately after the shooting clearly shows him wearing ear buds. The ear buds were later discovered in McBean’s pocket at the hospital after he’d already been pronounced dead. Just before the anniversary of his death, the manslaughter charges against Peraza were dismissed thanks to Florida’s infamous “Stand Your Ground” laws. The State Attorney is expected to appeal and a civil suit against Peraza is in the works as well. The three years of No Justice for the McBean family is but an echo of the 400 Years of No Justice for Black Lives on this continent. 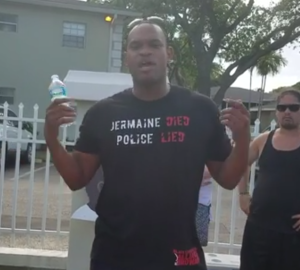 This shirt is to show solidarity with the family and friends of Jermaine McBean. You can order them here or reach us through the contact form.